Tania Bhattacharyya is a PhD candidate in South Asian history at Columbia University. She is a social historian who specializes in modern South Asian urban history, Indian Ocean history, and labor history. 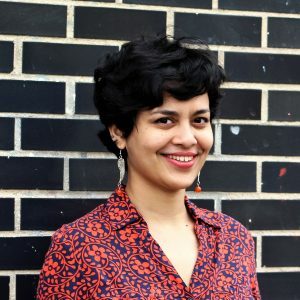 Her dissertation, ‘Ocean Bombay: space, itinerancy and community in an imperial port city, 1839-1945’ draws on archival and ethnographic research in multiple countries and languages to study the role of transoceanic, itinerant, and displaced people in producing communities and urban space in Bombay. Her work has been funded by Columbia University’s Richard Hofstadter and Evelyn Walker Fellowships, the American Council of Learned Societies, the Mellon/Council on Library and Information Resources fellowship for research in original sources, and a Social Science Research Council Dissertation Proposal Development Fellowship. Prior to her time at Columbia University she read History at the University of Oxford as a Rhodes Scholar, before which she graduated in History with the highest grades from the University of Delhi. At Columbia University, Tania has worked as a Teaching Assistant, as Graduate Assistant for the American Historical Association/Mellon funded History in Action/Career Diversity Initiative, as Managing Editor for the International Labor and Working Class History journal, and as Graduate Coordinator for the Center for International History.